Saskia is still having a fantastic time in Chile. If you want to see what she has been up to check out posts one and two, three and four. 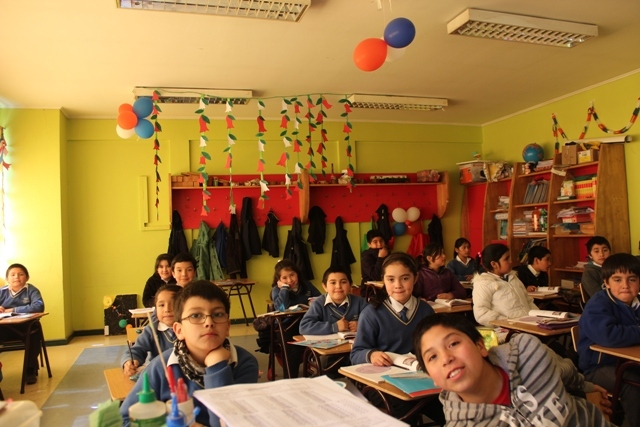 Today she is sharing her experience of what a day in the life of a volunteer in Chile is like. Reading this sort of blog is my favourite as it gives a real insight into what it is really like. “One thing about the Chilean culture that took some time to get used to was their idea of organisation. You can never really know what is happening and when, but we have learnt the best thing to do is to just go with the flow! As a result no 2 days in Chile are ever the same, and you can never anticipate what will happen, but I am going to try and describe my most normal week day and what it involves. 7am: wake up and get ready for school. This is getting easier everyday as the mornings get lighter but yes, it is a struggle! My host mum usually leaves me a flask of hot water and lays breakfast things out the night before so that I can make sure to eat something before I leave. 8am: start of the school day. My school is about a 15 minute walk from my house this always helps to wake me up due to the brisk, chilly walk up the hill! The children all have an assembly first thing and then get breakfast, something I wish we got in England, free breakfast yes please?! 8:30am-1:15pm: throughout the morning I have 3 classes of one and a half hours with a small break between each. I always find that the classes are longer than I expected and hence you need to think of way more content than you expect, but I enjoy the full on mornings because it gives you an excuse to relax all afternoon! 1:30pm: lunch! As I described in my last blog, this is essentially the main meal of the day and for me it typically lasts around an hour, especially by the time I’ve had tea with my host mum in the garden afterwards- a routine she very much enjoys! 2:30pm onwards: most days I have a free afternoon unless there is an after school club or event which I am involved with which is generally only once or twice a week. My most common way of filling this time is to meet the others for a coffee and a wander round town, but since the days are now getting much longer it is possible to go for hikes and things in the afternoons too. 8pm: at around this time we have Once, it varies from family to family but we usually eat once everyone is home and in for the evening. This meal is much more relaxed and it’s very common for us to have Once at each other’s houses if we happen to be round or near. If this sounds like a great way to spend your days then check out our website to find out how you could get involved.